Over the last few months, we’ve been analysing data on pupils who leave their state-funded secondary school before the end of key stage 4. We’re concerned about potential ‘off-rolling’ of pupils where schools may be encouraging pupils to move, and want to better understand the schools and pupils that are affected. How might the context of the school affect the number and proportion of pupils that leave? And what is an ‘exceptional’ level of movement? We used pupil-level data from the Department for Education’s school census and tracked pupils that were in year 10 in 2016, and would be expected to be in year 11 of the same school in 2017. Over 19,000 pupils did not progress from year 10 to year 11 in the same state-funded secondary school. This may be only 4% of all year 10 pupils, but it can be very disruptive for the pupils and families involved, particularly at such an important time in the pupils’ education. Of course, we recognise that there are a wide range of circumstances that may lead to a child leaving one setting and moving to another. Many of these 19,000 pupils moved to another state-funded school, but around half did not reappear in the census of a different state-funded school. We recognise that some of these pupils may have moved to an independent school (including special schools and alternative provision), or become home-schooled. Some may have, however, ended up in an unregistered school, or dropped out of education entirely. Unfortunately, it’s not possible to know the full story of where pupils went to, and why, from the school census data alone. Unsurprisingly not all children are equally likely to be affected. 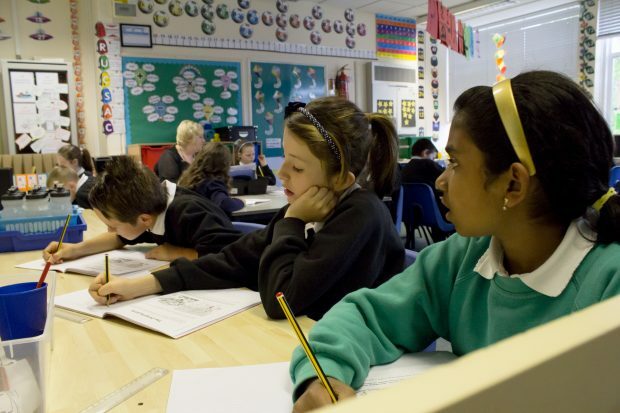 Children with special educational needs, children eligible for free school meals, children looked after, and some minority ethnic groups are all more likely to leave their school. For example, around 30% of pupils who leave their school between years 10 and 11 have special educational needs, against 13% of all pupils. Where these pupils go to is unclear for half of these pupils, which could be a sign that a large proportion are being home-schooled. More than a quarter of all the pupils that leave their school go to state-funded alternative provision/pupil referral units, but only a small proportion move to a state-funded special school. The incidence of this possible ‘off-rolling’ is not evenly spread across the sector. A higher proportion of schools in London are seeing movement of pupils compared to other areas of the country. Academies, particularly those in some multi-academy trusts, appear to be losing proportionately more pupils than local authority schools. Conversely, local authority schools seem to be taking on proportionately more pupils. Are these differences partly due to the context of the schools, and the types of pupils they cater for? Or is it also the policies of particular schools? To investigate this further, we’ve looked closely at how the characteristics of the pupils may influence how many pupils leave the school, and have developed a statistical model to estimate what proportion of pupils we might expect to leave each school. This takes into account the characteristics of the pupils, such as the percentage of pupils on free school meals, the proportion of pupils with special educational needs, gender, and prior attainment (key stage 2). The model helps us to see where ‘exceptional’ levels of pupils have moved, and where this has been a consistent pattern in each of the last two years. 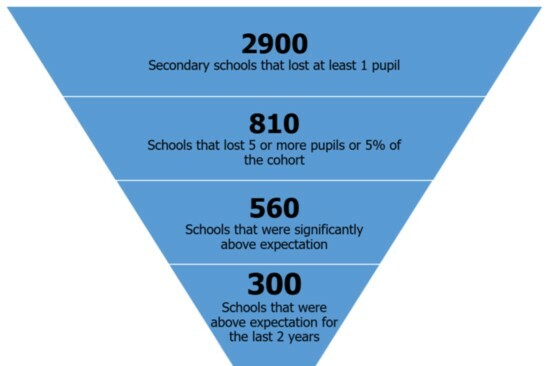 Out of 2,900 schools that lost some pupils between years 10 and 11, the model highlights 300 schools with particularly high levels of “off-rolling”. While this might sometimes be attributed to ordinary factors such as several family moves, this kind of analysis helps us focus our attention at inspection. This model will be used to inform our discussions with local authorities and multi-academy trusts, and to ask questions in school inspections. We’ve also been discussing these issues with FFT Education Datalab. They’ve been looking at how performance data, such as Progress 8, is impacted by pupils leaving the school before they sit their GCSEs. We plan to collaborate further with them in the near future. It’s not possible to know from the data available the reasons why so many pupils are leaving a school, and whether those moves are in the best interests of the pupils. But the data gives a starting point to have these important conversations with the sector, and to better understand this issue. Great to see this issue being investigated. Although we were not directly affected, my daughter was very upset when a number of her friends were forced to leave by her school, who were obviously more concerned about their ‘rankings’ in league tables than their responsibility for their pupils’ welfare. All the more sickening when the school boasts of their exam success later! only the insiders know the cost and reality of those statistics. Off course government must also take their responsibility, in creating such a system. The reason may be linked to the fact that in the past and present Local Authorities still have the power to inspect registers. However staffing cuts mean that not all LA's have the capacity to do that. No one other than Ofsted Inspectors have the right to inspect Academy registers and to be fair not all inspectors know what they are looking at/ for, not do they have the time. Some civil servants ( and ministers ) in the DfE think Ofsted do inspect registers despite being told otherwise. So either the DfE appoint experienced people to look at all registers or there is a heavy penalty for schools who off roll illegally. Never heard of 'off rolling' until it happened to us. And yes it was an academy. Very painful for the (usually) SEND pupils. Where do they go? Most are badly scarred by the process, suffer immense harm and go on to develop serious mental health conditions. The parents are forced, under threat of prosecution, to keep sending their children into these toxic and damaging situations. The only way out is to deregister the student. No longer burdened with co-ordinating and funding "reasonable accommodations" the govt, the LAs and the schools save £££. For as long as the SEND system is not properly regulated off-rolling and other harm to vulnerable children and YP will go on. One will find the SEND needs will have been under-proved in the years leading up to Y10. That will be because SEND funding is not ring-fenced, so the schools use it to top-up their general budgets. By Y9 into Y10, the students are no longer able to access the curriculum. By Y10, the school will have earned nicely from that pupil's top-up funding, and will need to force the pupil off the register to protect league tables and progress 8 scores. Until schools are held fully accountable for SEND provision, and the CoP directives changed from "should" into "must", this will continue. Tribunals lack powers and HTs know the worst outcome for them will be a forced apology to the pupil, told to improve teacher training and maybe to put the SEND provision in place. Until real penalties are slapped on the schools, and compensation awarded to pupils and families it will continue. Need to introduce separate SEND inspections, every two years, consulting with EVERY parent who's child is on the SEND register (not just the ones the senco suggests!). Give schools a rating for their SEND provision, and enforce that it be displayed on the school website alongside the latest "general" Ofsted ratings. This govt knows very well off-rolling and worse is happening for these vulnerable children every day. The govt also knows why it is happening. Cutting legal aid helps keep it quiet. Some may go to placements more able to meet needs. Many will be sent out to improve data - I wonder if some even know that they have gone? I have heard that they can go off for a data capture and then magically return without knowing they did this! Not sure if this is possible? For others where attendance is an issue parents can be told that if they can't get them in then the courts are waiting and this will lead to home ed. Sadly though I feel outcomes/data and progress 8 are what counts 'for the good of all'. So, for some, the thought of giving up on the few for the good of the many means they can sleep at night? Hi, Thank you for your observations about off-rolling. Schools must do right for all pupils and in doing so must act in accordance with the law. Removing pupils unlawfully is not acceptable and that is why Ofsted is concerned to draw attention to this matter. Hi, Ofsted note that this can be an issue, and it is for this reason we will have discussions with local authorities and multi-academy trusts, and importantly look at this thoroughly in school inspections. However, we recognise that there may be times when it is necessary for schools to have high exclusions rates as part of a plan to restore good behaviour. Hi, Ofsted recognise this is an issue, which is why we have drawn attention to it. All children deserve the best education possible and home education should only be considered where this is in the best interest of pupils and where parents want this for their children. That is why we will be looking at this via our school inspections. I recognise the need for good behaviour, however in some cases external factors can be at play, and some young people are pushed into a fight or flight response by schools' very strict 'behaviour for learning' policies, leading to a wide range of punishments. Having had some fixed-term exclusions, my son's school have wanted to send him to an alternative provision school since the autumn of 2017 and more recently have threatened us with legal action regarding his school attendance, to quote the email verbatim: “if he remained at (name of school) then the School and the local council would have to proceed with legal action to enforce school attendance”. We find that attitude, put in writing by a senior member of staff at the school, absolutely shocking - blackmail basically - ordering us to agree to get him out or be taken to court. In principle we thought the idea of moving him to another school was a good idea, however we knew, realistically, that this would be set up to fail on several counts: that he would refuse to go, and the long distance and difficulties travelling there would mean him giving up on going, even if he were to start; he would feel that he did not fit in with the other students. Hi, Thank you for your comment. If you wish to make a complaint against a school, please use the Complaints process for raising your concerns with the relevant local authority, the Department for Education or with Ofsted. You can find further information and advice here https://www.gov.uk/complain-about-school/state-schools. Education legislation is a matter for the Department for Education, any suggestions in this regard would be best directed to them as the lead policy department. Thank you for your reply and the suggestion to contact the Dept for Education. I appreciate the opportunity to communicate with you directly in an open forum. I suspect that statistics are partly to blame, and I cannot see why statistics should form part of OFSTED inspections except for exam results and number of pupils on roll. As parents, when choosing schools, the most important influence in our choice was to visit the schools in person, after that to read the text of the inspection reports and check the GCSE or SATS results. Statistics on authorised or unauthorised absence were of little interest to us, however head teachers set too much store by them. Are heads competing to have the lowest absence percentages, by any chance, and then using this "achievement" on their CV to negotiate their salary at the next school employer? I'm thinking of the rise of the so-called "super heads" of academies and principals of multi-academy trusts on inflated salaries. As usual, it is the interests of the few (well-off) at the expense of the many (middling or poor). The gradual decline in social values, compassion, selflessness and dignity and respect in our society under the current government and austerity, with associated cuts to school budgets, is truly frightening and is something we should all be waking up to, before it is too late. Hi, Thank you for your comments regarding school performance and attendance information. During inspection, Ofsted inspectors consider overall absence and persistent absence rates for all pupils, and for different groups in relation to national figures for all pupils. You can find more detailed information about how inspectors reach their judgements about the personal development, behaviour and welfare of pupils in the School Inspection Handbook https://www.gov.uk/government/publications/school-inspection-handbook-from-september-2015. Paragraphs 176-183 of the handbook may be of particular interest to you. Off-rolling. School rated Ofsted Outstanding. HT email to a parent, last day of school Y10 SEND student – Grammar school academy. Note: Heavily edited for brevity. “Following the medical recommendation (child’s) absence remains a major stumbling block to any additional support (…). I would like you to consider home-schooling (child). (Child) would therefore need to be formally taken off the school roll with a formal communication from you. Educational Welfare would also need to be informed at this stage. If you wish (child) to remain on the School Roll, then I would need to set more formal conditions. I would require (child) to sit formal Trial Examinations (Edit - note: this child only) in School in each of the subjects (child) would be intending to sit and I would expect (child) to be able to show that (child) is capable of passing such subjects as I have no intention of setting (child) up to fail whilst he remains a (name of school) student. Perhaps, if more consideration were to be given to the progress pupils make during their time at school, using value added scores, this would be changed. Schools, particularly, academies would then be less inclined to off roll those pupils who may be making excellent progress but who do not achieve the benchmark. In addition, Ofsted should be taking particular note of off rolling and adjust their judgements downwards for schools with high off rolling rates unless there are particular reasons for it. Hi, while Ofsted absolutely support the right of schools to exclude pupils where it is necessary and appropriate to do so, the exclusion of pupils for school performance purposes, be that formally or through pressure on parents, is unacceptable. Our inspectors are given comprehensive training in the law and practice around ‘off-rolling’ (the removal of children from the school roll), including how to spot any such patterns. Our handbooks make clear that inspectors will request and review data about pupils being taken off roll and the schools use of exclusion. Questions related to this data are not routinely asked in every inspection, however briefings provided to inspectors ahead of inspection now always indicate where there have been unusual patterns in pupils leaving the school at times other than the usual points. In such cases, our inspectors always probe a school as to the reasons behind any unusual and concerning patterns of ‘off-rolling’ and address any concerns in the school’s inspection report under the ‘Leadership and Management’ judgement. It's not just actual off-rolling but also about constructive off-rolling of non-SEND pupils by the school making life so difficult that the parents consider deregistering their child from school for home education. The child might not have a SEND or diagnosis requiring SEND adjustments, but could have Additional Support Needs, some of which are due to difficulties experienced by the child, others due to external factors. 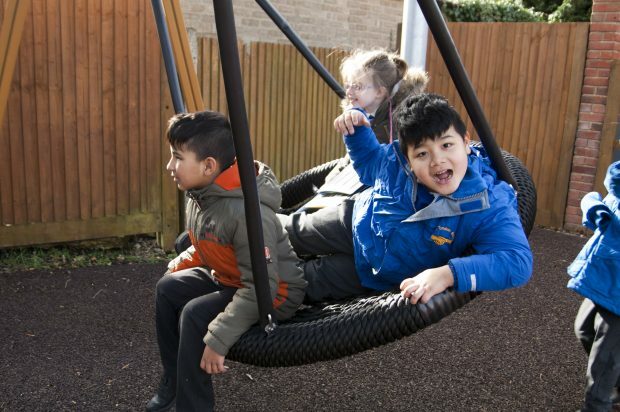 The number of children in home education has risen considerably, and it is good to read in the media that Amanda Spielman and Parliament are taking this seriously. Hi, While Ofsted absolutely support the right of schools to exclude pupils where it is necessary and appropriate to do so, the exclusion of pupils for school performance purposes, be that formally or through pressure on parents, is unacceptable. Our inspectors are given comprehensive training in the law and practice around ‘off-rolling’ (the removal of children from the school roll), including how to spot any such patterns. Our handbooks make clear that inspectors will request and review data about pupils being taken off roll and the schools use of exclusion. Questions related to this data are not routinely asked in every inspection, however briefings provided to inspectors ahead of inspection now always indicate where there have been unusual patterns in pupils leaving the school at times other than the usual points. In such cases, our inspectors always probe a school as to the reasons behind any unusual and concerning patterns of ‘off-rolling’ and address any concerns in the school’s inspection report under the ‘Leadership and Management’ judgement. Glad to see Ofsted addressing itself to this issue. It's been widespread over the last 5 years under the 'guise' often of; home schooling; veiled threats to to parents to exclude troublesome students which encourage parents to seek places in local 'needy' schools with low PANS; bogus covert selection policies discriminating between able and less able students. All a product of lip service to national fair access protocols. Sadly off-rolling also occurs in the independent sector, I understand this is outside of Ofsteds remit.My child was excluded,resulting in a Send Tribunal, the school were found to have discriminated, failed to provide an education, We went through a flawed internal complaints procedure, were told not to have legal representation, only to appear before a panel of lawyers, one of the governors is deputy chair of Barnardos, We were not alone in our child being off rolled. The school attempted to make me sign a non disclosure, they are now attempting to silence with the threat of legal action. Hi, Off rolling is an issue of increasing concern to Ofsted and the sector. The Chief inspector made it very clear at the launch of her first annual report last year. Under our current inspection framework, where inspectors find there has been unusual patterns of off-rolling this will be considered as part of the leadership and management grade. We are considering carefully how best to address off-rolling issues in our new inspection framework, which is currently in development. We cannot comment on individual cases. We inspect non-association independent schools at the request of the Department for Education, which is the registration authority for independent schools. As a HT, I am saddened that people think all schools and HTs are the same. We are committed to doing everything we can for our students. We do not illegally exclude, we actively discourage home education and we do everything we can in our power to support a student in our own setting. There are times, however, when that is not enough. I collaborate with local heads and have taken two students on roll. Both would have been permanently excluded at their original schools if their HTs had not been dedicated to finding an alternative. The prospects for permanently excluded students are so poor that we always do whatever we can to avoid this - not for statistics or for the benefit of the school but to try one last ditch attempt to prevent a child spiraling out of control. In our case, the two students we have taken have settled in well. They have a fresh start, the peer group where the issues were is no longer a pressure and they can be themselves. They have hope. The individual students are important. In my seven inspections, I have not found Ofsted to negatively judge me for doing everything in my power to behave with integrity and avoid permanent exclusion wherever possible. Parents also have a role to play though. And so does society. Schools cannot fix all of society's ills and we also have the moral obligation to protect the learning and welfare of the all students in our school as well as the individual. All difficult things to balance in a time of diminishing resources. My child has had some anxiety and mental health problems since return to school in September 2018, due to many stressful incidents in a short period of time,resulting in being unsettled in class. Previous to this, had spent 3 years in the same school with no problems. A meeting with the school ended with one member of staff saying ' we don't want you to be one off the pupils that we ask to leave at the end of year 10' which is clearly premeditated that they are on the look-out for pupils to off roll. I am concerned that if I raise this directly with school they will be singled out and watched. Please advise. Hi, Thank you for your comments. Ofsted recognise this is an issue, which is why we have drawn attention to it. All children deserve the best education possible and home education should only be considered where this is in the best interest of pupils and where parents want this for their children. That is why we will be looking at this via our school inspections. My daughter has just been off rolled from our local Academy. My daughter suffers with social anxiety and school is real issue for her. Her needs were never met within school, they suggested we home schooled or recommended a non Ofsted registered school. I repeatedly asked for online alternative provision, which school would not use due to poor outcomes. Instead we got little tuition for the last 3 years then off rolled just months before her GCSE’s. The word discrimination comes to mind. They applied to the Council saying I wanted to home school (completely false) they then emailed me to say they had sent in our application for an EHCP this was also a lie, they had never sent this. Academies seem to have free reign to do what they want. My son is at an Academy which is part of a larger Academy group. He has been missing school days. He is intelligent and was always until recently in the top 30 kids out of 140. He achieved well in his Primary School and scored highly in original RoA for this secondary school. After a period of flu he went back to school and then I believe as he is in the first year of his GCSE studies fell behind. The teachers have not given him enough support to catch up. The academy seems to be obsessed with average GCSE league tables. He is now almost developing an aversion to school which he never had before. The academy gives him little support and some of the staff who are responsible for the wellbeing of the pupils do not even acknowledge or answer our emails. I believe they are perhaps trying to follow an unofficial process that might lead to them off-loading. I would like to see the off-loading stats for schools in order to determine if this Academy, Academy Group have been doing this a lot. Could you le me know where I can access the actual lists and statistics for schools that the reports is based on. Hi Maxine - thank you for your comment. Schools must do right for all pupils and in doing so, must act in accordance with the law. Removing pupils unlawfully is not acceptable and that is why Ofsted is concerned to draw attention to this matter. If you have followed the procedure as set out here https://www.gov.uk/complain-about-school/state-schools; and your complaint to the school has not been resolved, you can make a complaint to the Department for Education. Details of where to direct your complaint vary, based on the type of school that is the subject of the complaint. You can find all of the relevant information, including how to complain to Ofsted about the way a school is run here https://www.gov.uk/complain-about-school/state-schools.